Moving of the installation from the Biennale WRO 2015: SUW exhibition in the flat at 4 Lukasz Górnicki Street. The project engages local residents of the tenement house at Górnickiego St. 4 and its neighbourhood. The artists recorded chats with locals, gathering their complaints, confessions and hopes. They also collected useless fabrics – textiles, clothes, curtains or tablecloths. 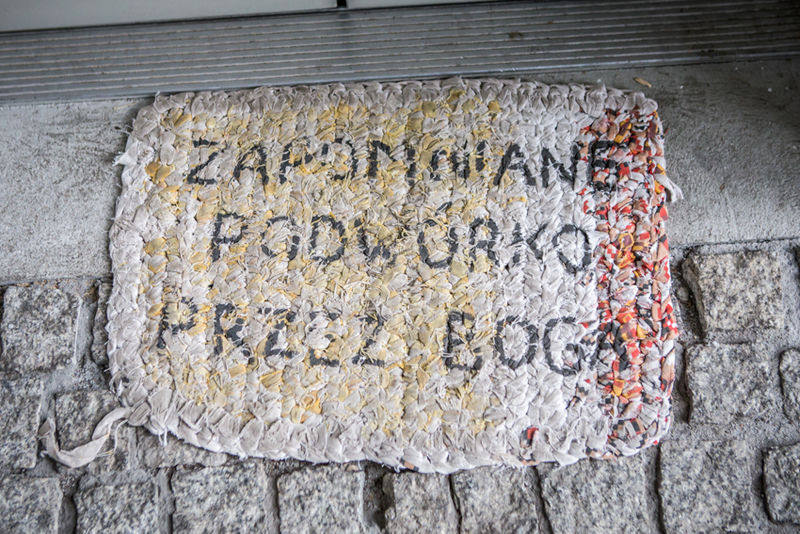 Using these materials, they prepared doormats with quotes, comprising interviews with locals. All of these mats were placed on the staircase. Following Mrs. Dulska’s thought: “Dirt has to be washed in your own home”, the artists added – start making order from your own backyard. Karolina Balcer (PL), born 1988 in Torun. Lives in Wroclaw. She specializes in painting. She also makes short films, collages and painting objects. Kinga Krzymowska (PL), born 1988 in Chelm. Lives in Lublin. She specializes in tailoring: sewing clothes and upcycling bags.